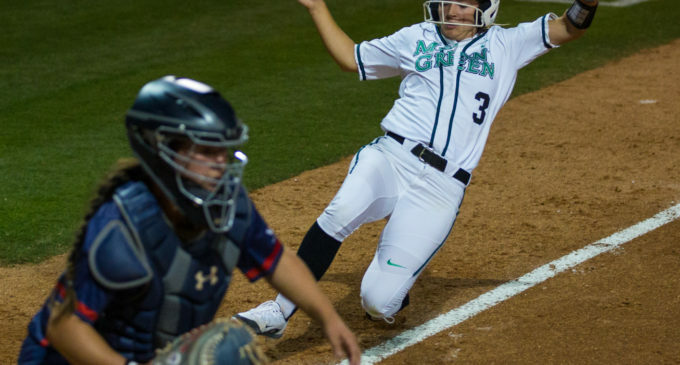 The North Texas softball team (23-12, 10-2 Conference USA) swept St. Mary’s (7-24) in a three-game series over the weekend to extend their current win streak to seven games. The Mean Green won by scores of 8-0, 9-2 and 14-7. Freshman pitcher Bailey Tindell started the final game for the Mean Green and earned her third win of the season, going for three innings, and allowing three runs on three hits. Junior Lacy Gregory kicked off the scoring with an RBI in the first inning of the final game bringing in Camille Grahmann for her 11th run of the season. The Mean Green then scored five runs in the second inning off of two RBIs each from senior Harley Perella and Gregory. The fourth inning saw three more RBIs from Perella and one from Gregory. Senior Sally Gastelo had three RBIs throughout the game as well. The Gaels responded to the North Texas pitching change of inserting Sophmore Hope Trautwein by scoring four runs in the fifth inning off of a grand slam from sophomore infielder Julia McCormack. Trautwein and the rest of the defense held the Gaels scoreless and secured the sweep for the Mean Green, counting two straight weekends with sweeps. UP NEXT: North Texas will take on Houston Baptist (14-17, 4-10 Southland) in Houston on April 9 at 3 p.m. Featured Image: Sliding into home, junior Haley Perella scores the Mean Green’s fourth point against Saint Mary’s on April 5, 2019. Image by: Kara Dry.